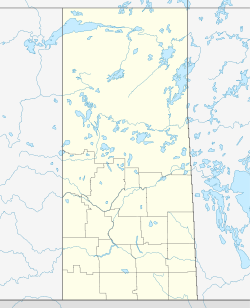 For other uses, see Batoche (disambiguation). Batoche, Saskatchewan was the site of the historic Battle of Batoche during the Northwest Rebellion of 1885. The battle resulted in the defeat of Louis Riel and his Métis forces by Major General Frederick Middleton and his Northwest Field Force. The Métis settlement of Batoche (named after Xavier Letendre dit Batoche) was established in 1872. By 1885 it numbered 500 people. The Métis of the area settled on river lots, and the community contained several stores as well as the Roman Catholic Church of St. Antoine de Padoue at the time of the Rebellion. Batoche was the de facto capital of Riel's Provisional Government of Saskatchewan. 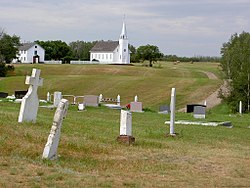 Batoche is a Southbranch Settlement. It is situated mainly along the east bank of the South Saskatchewan River between St. Laurent and Fish Creek. This area is part of the aspen parkland biome. This community consisted mostly of Francophones and Roman Catholics. Batoche was declared a National Historic Site in 1923. The visitor centre features a multimedia presentation about the history of the community and its inhabitants. There are several restored buildings with costumed interpreters who depict the lifestyles of the Métis of Batoche between 1860 and 1900. The sites include a NWMP encampment, a church and rectory complex, and a farm home. The sites are set at different locations around the community. The complex is open from mid-May through mid-September. ^ "FRENCH AND MÉTIS SETTLEMENTS". Encyclopedia of Saskatchewan. Canadian Plains Research Center, University of Regina. 2006. Retrieved 2013-09-17. ^ Batoche. Canadian Register of Historic Places. Retrieved 6 August 2012. Barnholden, Michael. (2009). Circumstances Alter Photographs: Captain James Peters' Reports from the War of 1885. Vancouver, BC: Talonbooks. ISBN 978-0-88922-621-0. Dumont, Gabriel. GABRIEL DUMONT SPEAKS. Talonbooks, 2009. ISBN 978-0-88922-625-8. Payment, Diane p. (2009). The Free People - Li Gens Libres University of Calgary Press. ISBN 978-1-55238-239-4. This page was last edited on 17 November 2017, at 03:39 (UTC).